Peter Grimshaw's portraits of classic movie monsters at CinemaSalem in October 2016. Peter Grimshaw's mash up of creatures featured by Universal Studios at CinemaSalem in October 2016. 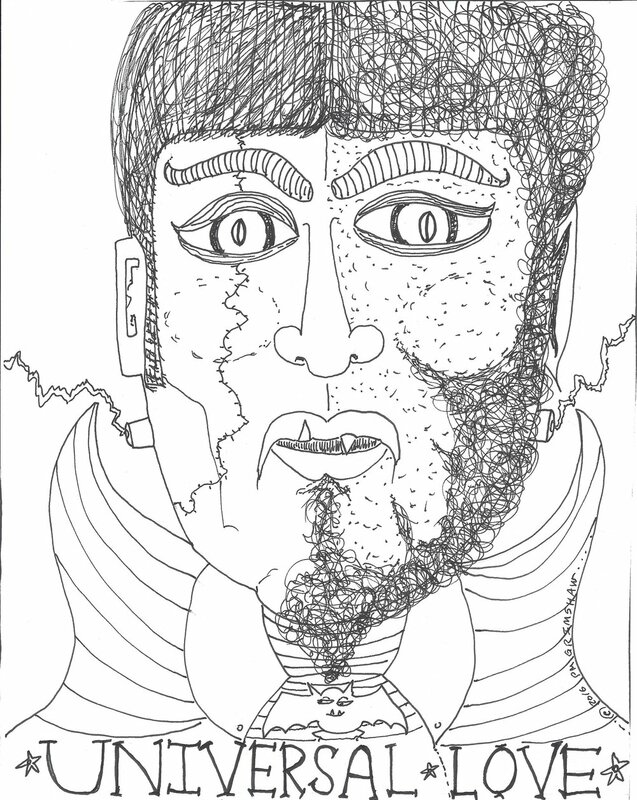 This WEREWOLF OF LONDON is from the "Universal Love" series at CinemaSalem in October 2016. 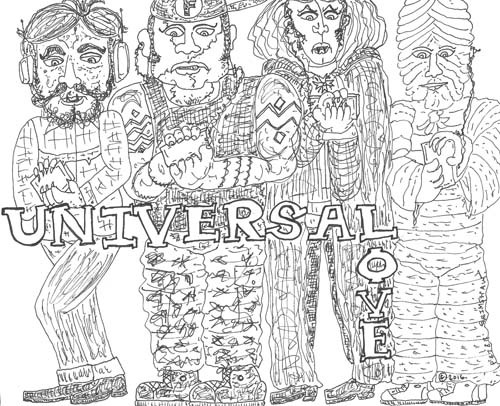 To celebrate Halloween in Salem we feature a solo show, UNIVERSAL LOVE, with the multi-talented PETER GRIMSHAW and his monster movie illustrations at CinemaSalem. Haunt the opening reception on Thursday, October 13 from 7-8 pm at CinemaSalem, located at One East India Square in Salem, MA. Explore the good and evil of these classic movie monsters such as Dracula, Frankenstein, and Godzilla. This series of portraits and their creative portrayals capture the spirit of these creatures. December 2016 will showcase some little art with a big punch in BAUBLES at CinemaSalem. We hosted 12 spectacular shows at Zephyr Gallery at 37 Turner Street. We had 59 incredible artists grace our walls. Our press clippings include a sighting in Art New England magazine, the cover story in artscope magazine by Molly Hamill, four “Suburbanite” spots in The Boston Globe by Wendy Killeen, the front page of The Salem News, and calendar listings in The Improper Bostonian and The Salem Gazette. This exciting endeavor with a weekly brick and mortar presence ended in September 2016. We will continue to be a cheerleader for our artists online, curate independent projects, host shows in pop up gallery spaces, and explore new opportunities to sell the work of our artists to individuals and corporate clients. While we have left the beautiful space we created on Turner Street, this move away from a planted storefront frees us to explore more opportunities in a world where the art market is changing, and where we can be more flexible to adapt to those changes. We want to thank all of the fabulous artists, patrons, and friends that have helped make this adventure amazing. Our Gratitude Gathering was September 24, 2016. We want to give some sugar to our artists and wish them continued success: Adam Harmon, Barbara Pero Kampas, Beads by Beardslee, Bill Kelley, Brenda Hallinan, Cappuccio Photography, Cassandra Miller, Christine Michelini, Constance Festo Lafond, Cuddy, Dan Browne, Dave Early, David Stoffregen, Delia R. Faria, Dino Rowan, East India Silk Company, Elise Mankes, Elizabeth Fox, Elynn Kröger, Ethan Hamby, George Courage, Glenn French, Heidi Milman, Hilary Emerson Lay, Jack Walsh, james bird, James Bostick, Jeff Dykes, John Andrews, Jon Sarkin, Katherine Richmond, Katie Wilson, Ken McTague, Ken Riaf, Laurie Bellin, Leetie Lovendale, Lisa Galperin, Mary Taddie, Melissa A. Richard, Mill 77 Trading Company, My-Linh Kotre, Pamela Schmidt, Patrick O’Donnell, Paul S. Cultrera, Sr., Peter Brefini, Peter Grimshaw, Ray Wengenroth, Rebecca deVries, Richard Flynn, Roderick O’Flaherty, Sara Ashodian, Tara Kossman, The Chalifour Collection, Tommy Gagnon, Tyson Schroeder, Vicki Ryer, Wendy Howard, Ziggy Hartfelder, and Zingerplatz Pictures. All movie monster illustrations copyright Peter Grimshaw. All rights reserved.